There’s something very satisfying about feeling the kind of crowd buzz that DIRTY DANCING‘s finale produces. Despite some problems with the show, the climactic moments left me with a smile on my face. The story is familiar to anyone who lived through the 80s; its the summer of 1963 and good-hearted “Baby” Houseman and her family are at the Kellerman Hotel for their summer vacation. While there, the precocious Baby finds herself getting involved with resort dance instructor, Johnny Castle, much to the dismay of her overprotective father. Its a classic story, beloved by women of my generation for certain, and one of the biggest hits of 1987. It launched the career of Patrick Swayze into orbit and is one of those legendary 80s movies that have a life of their own. Taking a film and putting it on the stage has become quite a trend with shows like “Ghost,” “Flashdance,” “Legally Blonde” touring through Cincinnati in previous years. And now its Baby’s turn. Baby herself is played by Jillian Mueller. She was previously seen in the Flashdance tour and got great reviews for her work and I suspect she will be getting credit for keeping this particular production grounded, as well. Her acting is the best of a mixed lot of it and boy, can she ever dance. Her likeability factor is off-the-charts, which is a huge boon to the show. “Johnny Castle” is played by leggy, muscular leading man Samuel Pergande. He moves around the stage like a graceful leopard but with the strength of a lion. His movements are delightful to watch. With these two at the center of the story, its imperative that they have chemistry and luckily they have it in spades. I have to give credit to the amazing dancing of Jenny Winton (“Penny”) and the superb vocal stylings of Jerome Harmann-Hardeman, Joshua Keith, Jennlee Shallow, and Doug Carpenter. Shallow’s work throughout the show kept me wanting more live singing as her voice control is outstanding. When Carpenter busted out with “In the Still of The Night,” I got chills and then when they sang the powerful duet, “I’ve Had the Time of My Life,” I fell out. They are incredible and I wish there were more opportunities in the show for them to shine. While staging a film has proven successful for some shows, it is not easy and the use of projections in this particular production was sometimes creative and other times distracting. I would love to see them trim down the story more, simplify things, and add to the dance numbers. In a show called “Dirty Dancing,” we ought to see some and apart from one short scene, the (albeit incredible) dancing is scrubbed clean. And honestly, there should be more dancing in general. I also was disappointed at the use of so much recorded music throughout the show. Given that this show is probably the best mixed audio I’ve ever experienced at the Aronoff, I’d have loved to seen more use of the talented musicians under the direction of Alan J. Plado. But everything the die-hard Dirty Dancing fans are looking for is here; the iconic characters, the famous line (you know the one and so did the audience who erupted when it was uttered), and the beautiful lift in the dance finale. The packed house seemed to appreciate every bit of DIRTY DANCING, as there was thunderous applause at the end along with a rousing standing ovation. These people loved what they saw and their joy was infectious. While the critic in me could nitpick the show apart, the “sap” in me appreciates that kind of thing most of all. DIRTY DANCING plays through October 5th at the Aronoff Center for the Arts in downtown Cincinnati. Given the level of advertising I’ve seen around town along with the popularity of the brand and the word of mouth that’s sure to be generated, I wouldn’t delay getting my ticket. You can click here for more information. 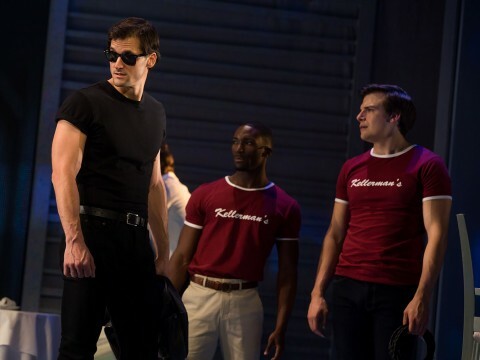 I seen the show last night, as a huge DIrty Dancing fan I was very excited only to be very disappointed instead. So much so that I was ready to leave after the first act. There were actually alot of empty seats around me in the second act so quite a few people did leave. The second act was much better and the finale was great but overall I would not recommend this show to anyone. Hi Tammy, thanks for reading and thanks commenting. I’d love to hear the actual reasons why you were disappointed as we’re all about constructive criticism on this site. Thanks again for your patronage of the blog!